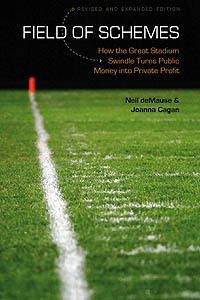 This entry was posted in Oakland Raiders, San Francisco Giants by Neil deMause. Bookmark the permalink. At first glance, the headline made me think they’d be playing in East Rutherford. Possibly the only place they haven’t called in the past 48 hours. As we all know, baseball is only meant to be played in places made for baseball and football is only meant for places built for football. This is why multi-purpose stadiums don’t work and cities have to spend over twice as much when it come to appeasing their sports teams. So what happens, big event football games, (lets play in a baseball park). With so many football facilities available, (football or college), you mean the Radiers can not find one. If the Chargers can play in a soccer stadium for a few years, I am sure the Raiders and NFL can stomach a college field for one season. What’s the difference, can not see big crowds for a team that is leaving anyway. It’s not like they will be in a super bowl anytime soon. Supposedly neither Cal nor Stanford want them. Lack of parking, game day congestion, etc. Although maybe Cal could use the rent money after that expensive (and beautiful) renovation. The Raiders should go full Houston Colt 45s and build a temporary facility in the parking lot. If the raiders had put forward an actual stadium construction plan and a $10M deposit, they could have triggered the out-clause in the A’s lease and have been building already. But the NFL getting it’s accustomed massive subsidies was a more important hill to die on. The attendance numbers are easily manipulated but the Raiders did “average” 57,775 per game in 2017 and 57,919 per game in 2018. With the capacity of at&t being 41,915, we could see a number of “sell outs”. So if this happens I’m curious how hard the Giants slammed the Raiders financially for this to go down. Seems silly to have a football team tear up your golden gem of a baseball park for little financial gain. If they moved they’d probably be scheduled for the 4pm Eastern start, which is an 11am start in Hawaii, or either of the prime time starts. I laughed so hard when I saw this on Sunday night. A shared stadium was a problem but they’re perfectly okay with playing in one built entirely for baseball. Can the Giants need the rent money so bad that they would rent out their field for one year to the Raiders? Maybe. If the Raiders were willing to pay 7.5 million to Oakland for the 2019 season how much would Giants ownership charge? The same?A bit less?And what about additional police and parking attendants on game day. Who pays for that? A moot point because the 49ers have to waive their territorial rights for San Fransisco for this ever to happen. And the NFL has to sign off on it which they probably would. But back to the 49ers. Why would they give up their territorial rights for 1 year and receive no financial compensation when they could instead rent Levis stadium for 1 year and pocket the rent money. Something to think about. It’s a good point. What do the Yorks gain by agreeing to this? Of course, the same goes for the Giants… it seems unlikely that they are going to earn $1m per game for the Raiders playing there. And if it costs $300k for the Oakland coliseum to be switched to football config and back, what is it going to cost at a baseball stadium which was never meant to house a football team? Yeah, well…. colour me skeptical on this one. If anyone wants to see what the China Basin/PacBell/AT&T/Oracle/insert corporate name here stadium looks like in football config…. Very cool link on the one season of the XFL. Thanks for posting it.I’m sure the majority of the damage done to Pac Bell Park at the time was due to the time of year the San Fransisco Demons played their games there. Still, there would be some damage if football is played there in 2019. The San Fransisco Bowl should have never moved to Santa Clara as Levi stadium is lucky to draw 35,000 for the game. I would expect – if this does go through and the Raiders play there for one season – that the Giants will require they start their NFL season on the road for a couple of weeks (maybe followed by a London “home” game?) so that there is minimal overlap between the football and baseball seasons. But what happens if the Giants are actually good and end up playing into October? for this last season in the bay area. Ian Rapoport now reporting that the Niners are going to block the Raiders from playing in SF. Which is why this is so odd. If the Raiders hadn’t secured the 49ers approval first why even enter negationation with the baseball Giants? The ’97 Grand Voyager not only doesn’t have sat nav, it doesn’t have any kind of built in personal assistant either… NFL owners are big picture guys, they can’t get bogged down with trivial details like contractual requirements or territorial rights.